Presented by Chris M. Smith, Dave Ansell, Ginny Smith. We need to increase performance of wind and wave powered systems to better harness the potential of these free, clean sources of energy. Wind power is a widely used form of renewable energy, but improvements can still be made to better harness the power of the wind. Wave power, however, is much more difficult as the up-and-down motion of the waves is harder to convert into useful energy. Dr Richard McMahon from Cambridge University works on improving the output of both types of technology. These types of power rely on simple generators. Ginny & Dave explain exactly how and why generators create energy from movement. Richard - Wind power is relatively mature. It's making a big contribution to the generation of electricity in many countries. The thing is to reduce cost, improve reliability. I work on generated technology that will achieve that. Chris - When we say wind power, how are we trying to harness wind power? Is that just with windmills or are there other ways of doing this? Richard - The way that's emerged if you like as the sort of standard way of doing it now after a lot of years of development is the thing that I think most of us are familiar with, which is the horizontal axis 3-bladed wind turbine which you see everywhere. People have tried other different forms of wind turbine, but the main one for the foreseeable future is the one I have described, the 3-bladed horizontal axis machine. Chris - How does that actually work? Richard - Well, you need some wind to start with and the wind blows on the blades. The force of the wind turns the blades and if you look at these wind turbines, you see the bit behind the blades which is called an nacelle. In there, you think it might all be electrical generator - actually, the generator is about 1/3 of it. The biggest thing is the front bearing because you've got all those weight of the blades on the front of the turbine and there's probably going to be a gearbox as well to increase the speed from the very slow rotation of the blades to high speed for the generator. Chris - How much electricity do we produce with wind in Britain at the moment? Richard - Somewhere around 6% to 7%. I mean obviously, it fluctuates. Some years are windier than others and the aim is by 2020, is to get to 1 in 7 kilowatt-hours produced from wind. Chris - It's quite a lot isn't it? Richard - I'd agree with you, yes. I mean, it shows that wind is really making a significant contribution and of course, it's genuine green energy. Chris - Indeed, but the wind doesn't always blow. Richard - That is quite true. We've got a couple of problems to look at. At the moment, we can balance wind with other forms of generation - so, there's no worry about the lights going off. In some countries like Germany and Spain where the wind penetration is getting high, we're having to look at sort of low balancing things, and that's where these smart grids come in, can we manage the load, so as to match the generation. Chris - So, this is where the wind stops blowing. So, we need something else that can step in and fill the gap while the wind isn't blowing. Richard - Well, depending on the time of day. My friends in the solar business I'm sure could help and of course, my other topic is wave power which, as another colleague points out, you can buy the tide tables for about 20 years ahead. Chris - Indeed. 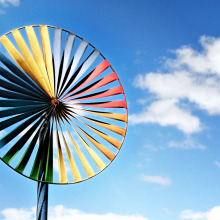 Who's got some questions about the future of wind power? Who shall we start with? Hands up. One over here. Let me just get to you. Nelson - I'm Nelson. How much wind power is produced a year? Richard - To give it in its sort of form or units, they're actually called terawatt hours - its a little bit difficult But if I go back to a sort of percentage, it's about 7% of our national consumption. 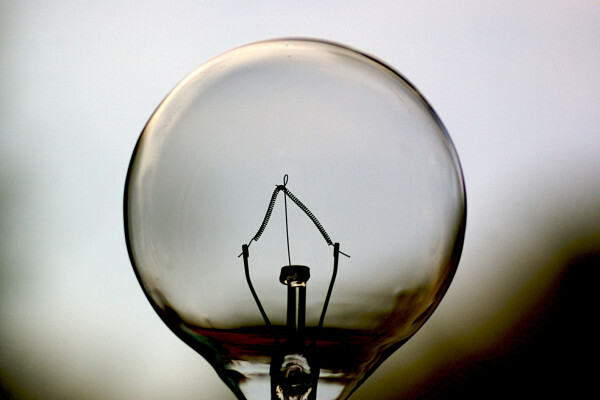 We burn about an average of 40 gigawatts which is 40,000 million units of electricity. If somebody is good at sums, you can multiply 7% of 40 gigawatts by 365 times 24. I can't do that in my head I do apologise. Chris - Neither can I. So, if we already are doing this, what can a researcher like you add? Is it just more turbines or are we trying to make these windmills better in some way? Richard - Well, the analogy I use is that suppose we're in the 1930s and we bought a car, we think it was a pretty hot car. We could get to 100 miles an hour, it would be really exciting, but look how much car technology has advanced. I think, although it's sometimes hard to envisage, in 30 years, today's wind turbines will seem rather basic and the ones of the future will be cheaper and more reliable, less noisy and all the good things that we want. Chris - Shall we find out actually how we generate electricity with a turbine, Ginny? Ginny - The way that wind turbines work is they have to convert that motion that the wind is turning the blades around. You've got a lovely model of it there, haven't you? So, the wind is going to hit those blades and turn it around. But then we've just got movement and that's not what we want. We want electricity. So, how are we going to turn that movement into electricity, Dave? Dave - First of all, we need someone to produce some movements. So for this, I need a volunteer. Dave - So Innes, if you can just stand at the side of this. What I've got here is 2 coils of wire and 2 magnets. The coils of wire are just wired up to this meter which measures how much electricity is being produced. At the moment, how much electricity is being produced? Dave - All we've done is wired some wire into a meter and nothing is happening. Now, what I'd like you to do is to take this magnet and poke it into the middle of the coil. If you move it forwards and backwards, can you start to see that needle moving a little bit? Dave - Try a bigger magnet. Innes - It's moving a lot. Ginny - So, the needle is moving backwards and forwards every time you move that magnet in and out of that coil isn't it? Ginny - So, what's going on there, Dave? Dave - So, if you move a magnet near a coil of wire, what you're actually doing is pushing little tiny subatomic particles which are parts of the atoms, pushing them around those coils, they're called electrons, pushing electrons around the coil, and that's what we call electricity. And the faster you move the magnet and the bigger the magnet, the harder they're pushed, the higher the voltage, and so, we get a bigger reading here. Ginny - So, why did it work better with the second magnet than the first, because the first one was a bit rubbish, wasn't it? Dave - So, yeah, the bigger the magnetic field, the more magnetic field you're changing inside that coil, the bigger the voltage and the molecules that you produce. Ginny - So, the second magnet was bigger so we got a bigger difference. Brilliant! So, that's very interesting. If you wiggle a magnet near a coil, you can make some electricity. But that's not really what's going on inside a wind turbine, is it? Ginny - There are little lights on each of the coils and I can see them flash as the magnet falls through that particular coil. So again, this is just a slightly more high-tech version rather than having someone there to move the magnet in and out of each coil. You can turn it and make the magnet fall through the coil. Dave - That's right and basically, everything apart from solar power is based on this principle - you move magnets near coils of wire and then produce electricity. Ginny - That still doesn't seem very efficient. You're having to stop every time and turn it back over. There must be a better way of doing it inside wind power generators and that sort of thing. Dave - So normally, if you arrange your magnets in a circle, in the coils in the circle, you could keep on going round and round, and round - you don't have to keep starting and stopping. You can also use gears to speed it up. Remember the faster the magnet moves, the more power you generate. So, you can make everything go in circles, and it's much more efficient and you can use a lot of power with quite a small device. Ginny - And that must be quite easy for wind turbines because they start off by going around in circles. Is that right? Richard - That's right, Ginny. Ginny - But you also look at wave generation and waves don't go around in circles, do they? They go up and down. Do you have to do something more like what we have here where you actually have something turning over and does that make it more difficult? Richard - You're spot on, Ginny. Sometimes we can use, if you like, underwater wind turbines where we've got a tidal current, a stream of water from the tides. But if we want to get power from the actual waves - the bobbing motion - that's difficult. People have come up with a lot of really clever things going right back to Salter's duck in the '70s tlil today and we've got a lot of things on test. But we haven't - I think got the right answer yet. Chris - What is Salter's duck? Richard - Essentially, it's a duck. It's a thing that sits on the water that bobs up and down with the waves, and uses that to convert it to oscillatory motion, you know moving motion and then you can do something quite complicated and this is the problem you can pump say, some hydraulic oil, and then you can use that to turn a hydraulic motor which is going around and then you can use what your rotary generated. Sounds complicated, it is a bit complicated. Chris - So, it doesn't work then. Is that a long answer to say, 'don't work'? Richard - No, it's not that it doesn't work. As we know, we don't want to pay too much for our electricity. So, we'd like to get the system simpler. So A, they run longer without trouble and B, it doesn't cost so much money to generate the electricity power. Jess - My name is Jess from St. Yves. My question is, have we crossed the threshold where we make more energy than it takes to make the wind turbine? Richard - Very definitely. If you think about the embedded energy in a wind turbine, sure, there's steel and copper, and concrete in the foundations. But on a good site, you'd expect to pay the energy back in under a year. There's a slightly more subtle question in that as wind turbines get cheaper, you might put them in less windy sites where it takes longer to pay back. So, maybe that's a worry, but I'm quite comfortable that we can pay the energy back quickly. Lowen - Hi. This is Lowen from Cambridge. Do you think that in the future, we'll have bigger wind turbines to capture energy or smaller, more efficient ones? Richard - I think both things will happen. On land, there doesn't seem to be a really big push to increase the size. The plan there is generally a standard unit, you know Henry Ford kind of policy, 'make it cheap, put them up.' Offshore, it's a different story because it's a lot of effort to put foundations in. So, if you're going to put a foundation and you probably want to put the biggest wind turbine, you reasonably can. So, we'll see I think growth in offshore size, but on land, I think it'll go for the mass production option. Edward - I'm Edward from a town called Swavesey. What's the biggest windmill you have ever made? Richard - Me personally? I've never had the privilege of building a whole windmill because a lot of things go into a windmill, but the biggest generator I've built is a prototype, is 250 kilowatts which is about enough for 200 houses. But the real size ones are now in the megawatts. And actually, we're building a prototype at the moment. So maybe in a year's time, if we're on the show again, I can show you. Frank - Hello. My name is Frank. I'm from the United States. I was just wondering, is there any kind of technology - you say you're doing wave technology as well - but putting these wind turbines on some kind of buoy system if they're going to be offshore to harness the wave energy in, the wind energy at the same time. Chris - Now, there's an interesting idea - a hybrid, so you can bob up and down and collect the wind. What do you think? Richard - It's an interesting point. We like, so far, to put our wind turbines on nice solid foundations both on land, and sea. And people are thinking, well, it would actually be quite nice to have some kind of floating system. The only trouble is that it's quite a bit of work to make sure it all is reliable and doesn't tip over and so on. Alisha - I'm Alisha, I'm from the USA. You always hear about bats and migrating birds and things flying into the wind turbines and getting killed. Is that still a big problem and if so, is there anything being done to mitigate that? Richard - Well, I'll have to be honest. Wind turbines do kill birds. They kill bats. You said, "Is it a big problem?" And that's quite a difficult question. I mean, in terms of things that happens to birds, they're not very likely to get hit by wind turbines. There are much worse fates for birds. So, I'm not pleased that we kill any but I mean, you got to keep in perspective. And I think we're quite good. Steven - Steven Halliday from Cambridge. Is there any way of storing electricity which is generated by wind turbines and not used when it's generated? For example, a windy night, lots of energy from wind turbines, no one wants it. Can we store it and use it later? Richard - Absolutely. The difficulties with that is, we can store it as so-called 'pumped hydro' - you can pump it up to a high reservoir and let it come out. There are other means. You can use batteries. The only trouble is that we would need an enormous number of batteries. At the moment, the economics do not favour a lot of storage. So, we just say, run a gas plant a bit harder or not so hard, or you have Norway as a neighbour. Holly - This is Holly, and I'm from Florida. You said you're building a prototype. Just exactly what is a prototype? Richard - When you design something new, you've got to find out whether it works. We've designed a new type of generator. We need to build it, test it, to see whether first of all, does it generate power and does it comply with all the sort of rules and regulations that you need for a wind turbine generator. Actually, we tested it in Norwich and we managed not to blow up the Norwich electrical supply, so we're very happy. Chris - I'm not sure if that's a slight on Norwich or a slight on your engineering. George - I'm George from Ely. I'm just wondering, how do wind turbines catch the wind? Chris - Yeah, good question. So how does the blade there that you've got on your nice model, how does that actually convert the motion of the air into electricity generating motion? Richard - Well, I can't blow strong enough George, but the wind coming in has a certain amount of momentum and the blade shape is such that the wind is deflected off the blades and that produces the turning force. You know how like an airplane flies - the wind cuts through the air and produces some lift. It's the same principle. Chris - So, what you're saying is that the air hits the blade and because the blade pushes the air in a certain direction, the air pushes back on the blade. And so, you actually make the blade move in a certain direction. Richard - That's right, yes. Chris - Any other questions or we're going to let this man off the hook? We have one more over here. Joe - Hi. My name is Joe from Caldecote. My question is, as I've heard about wind turbines, that they cost a lot of money to maintain. I just wonder is it efficient and effective enough for the money we generate from the wind turbine to support the maintenance? Richard - Well, if I were an investor in a wind farm, I would be very concerned about those issues. The general view now is that wind power on land is the cheapest form of generation including the maintenance costs. That's particular so in very good sites in the American Midwest. Scientists promise us a future where solar cells can be sprayed onto surfaces, so cars, buildings and streets could be covered in them. Plants are hugely efficient at creating energy from sunlight. Now researchers are trying to capture sunlight to make hydrogen the same way. Many people agree that hydrogen is one of the fuels of the future. It doesn't release pollutants when used, and can be created from water. However, currently, to break water down into hydrogen and oxygen takes a lot of energy. Many scientists are looking into cheaper and more environmentally-friendly ways of producing hydrogen from water. One of these is Dr Erwin Reisner, from Cambridge University, and he explained to Chris Smith how he uses sunlight to drive the process. Ginny Smith and Dave Ansell also have a go at splitting water into hydrogen and oxygen, with explosive results! Erwin - What we try to do is really produce a renewable fuel such as hydrogen as an example. So, I think it can be perceived as an extension of photovoltaic research where we take a solar panel, instead of producing electricity, we just try to produce hydrogen directly from water as an example. In a nutshell, you have water, you shine light on it and hydrogen comes out. Hydrogen is a very interesting chemical because it's energy rich, it's a fuel, and we can store and transport it. Chris - How does this work? How can you actually split the water up like that? Erwin - So essentially, we heard the first part was heavily inspired by photovoltaic research. So, we need a light absorbing material where we essentially harvest the photons, what we've heard about, and then instead of producing electricity, we just transfer energy directly to a catalyst. The catalyst is a substance that facilitates a chemical reaction. This catalyst we're using is a catalyst that withdraws hydrogen from water as an example. Essentially, yes we are physics and when we talk about fuels, we need some chemistry. That's my specialty and that's why we try to make fuel cell. Hydrogen is only one example. We can think all about liquid fuels to replace fossil fuels and with liquid form in all kinds of possibilities. Chris - So, you would have a material which would have access to some water. It could split the water into hydrogen and oxygen. How do you get the energy back? What would you do with the hydrogen? Chris - They're not dangerous though. I mean, Hindenburg didn't go down to - well, it did go down, that was the problem, but it wasn't too much of a success story from a chemistry and engineering perspective, was it? Isn't there a bit of a danger associated with hydrogen? Erwin - Yes, hydrogen is explosive that's for sure, but so is actually natural gas and gasoline is also actually quite dangerous and explosive. So, I think we definitely have the technology to handle hydrogen as a gas and it's not much more dangerous than other forms of fuels we're actually handling at the moment. Ginny - So, we're actually going to look at a more conventional way of getting hydrogen out of water. So, water is H2O which means it's made up of hydrogen and oxygen. So, if you want to get hydrogen back out, you have to split those molecules up. So, how do we go about doing that? Dave - So, what you want to do for that - so first of all, I have a pot of essentially water. There's a bit of salt in there called magnesium sulphate. This basically means it conducts electricity a bit better and makes something work a bit better. What we've also got is a power supply and this will apply a voltage to these two screwdrivers. And so, what I'm going to do is I'm going to make one of the screwdrivers positive and one of the screwdrivers negative. Now, if you think of water, it's H2O. The H is a slightly positive and the O, the oxygen is slightly negative. So, if you put a large voltage across water, the oxygen will be attracted to the positive electrode and the hydrogen will be attracted to the negative electrode. 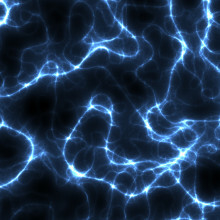 If you put enough voltage on, that will actually split those water molecules apart and you should get gases coming off. Ginny - Okay, so we've got a small beaker full of liquid and you're now putting a contraption made of two screwdrivers taped together into it. This looks a little bit dodgy. Dave - We'll try. So, I've now turned it on and something quite interesting is happening. Ginny - Yeah, can you see what's happening? Boy - I can see bubbles. Ginny - You can see bubbles, exactly. So, those should be bubbles of hydrogen and oxygen. Dave - That is the idea, yes. So, we'll let those build up nicely for a while and there's an easy way to see whether it's likely to be hydrogen and oxygen; we'll be trying setting fire to it because we can basically release the energy we put in by putting electricity through the liquid and splitting hydrogen and oxygen in from water. if we set fire to it, the hydrogen will burn with the oxygen to create water again and release lots of energy. Ginny - So, we've just talked about how explosive and dangerous hydrogen is. Now, we're going to set fire some of it. Dave - Sounds like a good plan to me. Ginny - Everyone thinks that sounds like a good plan? Ginny - So, we've got quite a good layer of froth on top of this little beaker now and I can see Dave is ready with a box of matches. Do I need to get back? Dave - In a minute, yes. The reason why it's creating a froth is a little bit of washing up liquid in there which catches the bubbles, so they're trapped nicely. Ginny - Because otherwise, they just escape and go off into the atmosphere and we will be able to set fire to them which should be no fun at all. Ginny - Did anyone notice that that bang sounded a little bit funny? Boy - It sounded like a balloon popping. Ginny - It did sound a bit like a balloon popping. It was quite kind of squeaky wasn't it and that's characteristic of hydrogen. Dave - It was a very, very sharp bang, which is because actually it wasn't just hydrogen you're burning. It was a mixture of hydrogen and oxygen. If you mix hydrogen and oxygen together, it will burn exceedingly fast. Actually, if you get the mixture right, they will burn faster than the speed of sound and you get what's called a detonation which is really destructive. If it is not perfectly mixed then you won't get a detonation. With air, it doesn't detonate quite so well, but yes, you have a very, very violent bang. Chris - Ginny and Dave, thank you very much. (applause) So Erwin, presumably your experiments don't quite go like that. Erwin - No, it's safer. Shall we show it? Ginny - So Erwin, you've brought an example of how you create hydrogen. It's a little bit different, right? Erwin - Yes, so this is a very simple system that's why I brought it here. eEsentially, what I'd like to show is in a test tube essentially, how you can generate some hydrogen with our energy saving light bulbs which are not very energetic. Ginny - We need quite a lot of power to put through our mixture to separate the water out. You're going to do that using less energy. Erwin - I will try, yes. Essentially, what we have here, this is really just water with some buffer at pH 7. There's nothing unusual about it. We'll just pipette this out quickly and you can see as normal water, it's just fully transparent. This means if you want to generate hydrogen with this mixture, it's very bad because no light is being absorbed. That's why it's transparent. Ginny - So, we need to absorb the light for the energy to split the water and transparent things don't absorb light very well. Erwin - Precisely. That's why I brought this dye here. You can see that the deep red coloration and essentially, I just take a bit of that. It's just an organic light absorber. It gives some colour. Ginny - Okay, so now, it's got a nice bright red colour. Erwin - Yeah, exactly. So now essentially, this dye will absorb light, but we still don't have this catalyst I mentioned before. So, at the moment, we absorbed the light, but it's not good enough to generate the hydrogen. So, we really need this catalyst, this substance that helps and facilitates the evolution of hydrogen. Ginny - And a catalyst is just something that is used in a reaction that helps something else be produced but doesn't actually get used up itself. Erwin - Precisely, yeah. This catalyst is what we develop in our laboratory. Ginny - So, that would mean you could use the same catalyst over and over again, just adding more water. Erwin - If we have a very good catalyst, yes, but at the moment, they do not exist, except they're very, very expensive and like platinum. But this is a very cheap material, a very cheap catalyst. At the moment, they're not sufficiently efficient to run for very long. So at the moment, all I do is shake it. Ginny - And it's a nice little bright orange colour now. It almost looks like it's glowing. Erwin - Yeah, it is exactly. What I will do now, I will just put it here in the back and it will probably take a couple of minutes but then we will see the formation of hydrogen. Chris - How will you know the hydrogen has been made? Erwin - Essentially, we can also light it up or we use analytical facilities in a chemistry laboratory. We know precisely what gas is being formed. Ginny - Setting fire to it sounds like more fun. Erwin - Precisely, yeah, I agree. Chris - We'll come back to that in a second. So, tell us a bit more about how you actually are working on this? The ultimate goal then would be, so that we have ways of converting plentiful sunlight into a supply of hydrogen. Erwin - Yeah, so that is the idea. At the moment, this is a very new line of research compared to wind technology or solar cells, which means we have no commercial applications at the moment. So, these are really being proposed at the moment, but it will still take a considerable amount of time really to bring this to the market place. Chris - Is it just visible light or can it use heat? So, if we took a waste industrial process that produces loads and loads of heat or a data centre. I mean, one statistic is that the data centres that run the internet are chucking more heat into the sky than they're actually using to run the data centre in aircon. And also, they're contributing more CO2 than the airline industry. So, can we turn that waste heat into something with this technology for example? Erwin - Yeah. Heat is certainly very interesting and I think should be used much more in the future, but we focus only on solar technology. If you use solar technology, either you run it like our systems just at room temperature or you work on solar thermal approaches where essentially you also work with heat, with solar concentrate, that's where you work at a thousand and more degrees Celsius also to produce fuels that way. Chris - Who's got some questions for Erwin on how hydrogen works? Bryan - Hello. I'm Bryan from Cambridge. My question is, we heard early on that the solar panels turned about 20% of the solar energy into electricity. When you then generate hydrogen, what percentage of the energy is transferred then? Erwin - So at the moment, depending on technology, we have two ways. 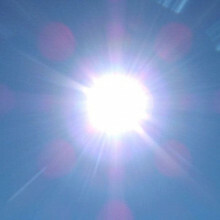 Either we convert energy directly, which means sunlight goes directly to fuel. This way, the record efficiency is about 13%. But these are achieved with very expensive materials and effectively, systems do not last very long. An indirect approach would be to couple a solar cell plus an electrolyte system as we've just seen before. With such technology, we can probably reach 15% to 20% or even 30% very easily on an industrial scale. James - Hi. My name is James. I'm from the United States. You said the technology is new. However, what commercial applications were you looking for this technology and also, what are hurdles that you face going to towards that? Erwin - The main hurdle is essentially - there are several - but the main problem at the moment is the cheap price of hydrogen produced from fossil fuels. So at the moment, all the hydrogen we see which might be quite interesting is effectively not renewable hydrogen. We might see all the green hydrogen buses driving around but this hydrogen is all produced through industrial processes from fossil fuels. And this hydrogen at the moment is about an order of magnitude cheaper to produce than any renewable forms of hydrogen. So at the moment, what is really letting us down is the very low cost of hydrogen derived from fossil fuels. Joe - Hi. It is Joe. My question is, can we use dirty water or sea water to generate hydrogen because pure and clean water, we are so of it in this world anyway? Erwin - Yes, it's certainly feasible and people have shown that this is possible. So essentially, with seawater, we mainly deal with highly saline water, full of sodium chloride. But in principle, there's nothing that holds you back to use seawater to generate hydrogen renewably. In fact, it might even help because there's an electrolyte already in the water. Erwin - Electrolytes are simply a conductor in the aqueous solution. So, if you want to electrolytise water for example you need a conductor in electrolytes. Ginny - So, we had added one to our demonstration here in order to make it carry the charge better. So actually, if you were doing this kind of electrolysis to split it, it would probably be better with seawater. In fact, it works very, very slowly if at all, with pure water. Dave - The only disadvantage with electrolytising seawater is that instead of producing oxygen in the other end, you'll produce chlorine which is a chemical weapon, so you have to be careful with that one. Ginny - We decided not to go for that tonight. Erwin - Chlorine is also produced by the industry at the moment. It's quite available chemical, so we might even be able to use this one and produce renewable chlorine this way. Chris - How is your catalytic breakdown of water going? How are you getting on? Chris - Gently, He says gently - is this because it's explosive? Ginny - Can you see? Ginny - There are some bubbles appearing. What is that in the bottom of the test tube? Erwin - This is hydrogen that comes from water. Ginny - There's a little white thing. Erwin - This is stir bath. This is just to stir the solution. Ginny - Okay, so there's something in the bottom to stir it and you can see on there, we formed little bubbles of hydrogen. Erwin - Yeah, the bubbles like to accumulate at the stir bath. Ginny - Okay, so if Dave takes it around, you should be able to see - there's not very many. I think ours was more impressive, but you did do it with light and we had to use a very high voltage to get that much. Chris - Are you effectively trying to recreate photosynthesis here? I mean, plants are very good at gathering energy from the sun and turning it into a chemical form of energy that they can use elsewhere in the plant or store as sugars turned into starch. So, is that sort of what you're doing? Erwin - Precisely. 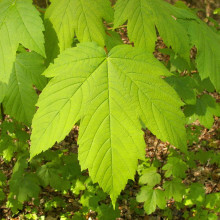 So actually, we do look at natural photosynthesis, try to learn from it and try to mimic the processes. The field is in fact called artificial photosynthesis. So, we do try to adopt with chemistry, materials chemistry to adopt and mimic processes in photosynthesis. Next Do flies have blood?